First sentence: Mrs. McGillicuddy panted along the platform in the wake of the porter carrying her suitcase. Premise/plot: Poor Mrs. McGillicuddy! She witnesses a crime when she's on a train--the crime takes place on a passing train--and NO ONE believes her. No one but Miss Marple that is! Miss Marple knows her friend did not imagine a man strangling a woman. Since the police aren't going to bother with an investigation, it's up to her and her friends. 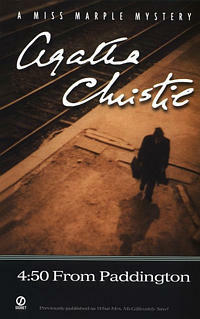 Miss Marple hires a woman--Lucy Eyelesbarrow--to do the job. Lucy gets hired on at an estate--the nearest estate to where Miss Marple thinks the body might have been thrown off the train--and in her spire time Lucy will hunt for the body. It doesn't take her long--not really, not all things considered. What takes time is identifying the woman. Who was she? What was she doing in England? Is she in any way connected to the family or the estate? Could Lucy be living with a murderer? My thoughts: I love, love, love this murder mystery. The murder occurs BEFORE Christmas but most of the book occurs in January or thereabouts. Lucy is working for a very eccentric, quirky family. Some of these family members are quite memorable, almost delightful. Miss Marple is staying nearby and posing as Lucy's aunt.